Inside NextReports Server any user can see a list of dashboards created by him or shared to him by other users. When the user logs-in he will see its personal dashboard 'My'. 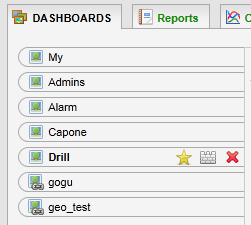 In server 4.2 version, any dashboard will have a special action to set it as default (star icon). If no dashboard is set as default then 'My' dashboard is loaded at log in. If a dashboard is set as default then that dashboard will be loaded. If you follow only one dashboard in particular, this new feature will spare you the time of selecting it anytime you enter the application.